The common control system fitted to every autoclave in the Rodwell range. The MP25 has evolved to be one of the finest laboratory instrument control systems on the market today. What sets this system apart from any other control system is that it is totally interchangeable. 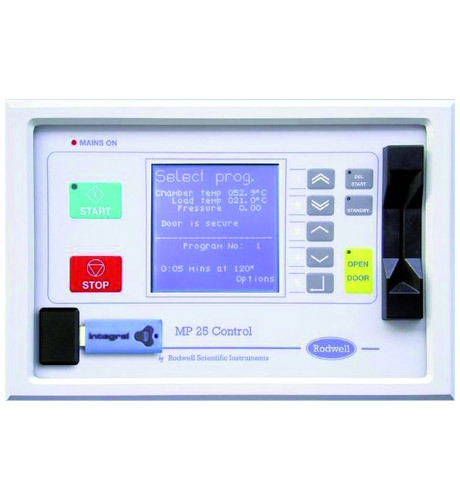 The same MP25 control system can be used with any Rodwell autoclave, from a bench top to a large square chambered vacuum machine. Can be programmed and stored by the laboratory Supervisor. (On/Off) prevents the sterilise timer from starting until the chamber and load have reached set point temperature. Holds the chamber at approximately 100°C (without pressurising) for a pre-determined time during the heating period and allow efective steam penetration into the load. Timer option allows the autoclave to be pre-programmed at a pre-determined time so the autoclave completes a cycle just before the lab arrives for work the following morning for pre-prepared warm media. Keeps the chamber warm at the end of the cycle for pourable media. This is adjustable to allow the operator to select the optimum temperature. Exhausts the chamber at the end of the cycle for dryer glassware and instruments upon completion. Need Advice on our MP25?